Hiroshima (広島市, Hiroshima-shi, [çiɾoɕimaɕi]) is the capital of Hiroshima Prefecture and the largest city in the Chūgoku region of western Honshu - the largest island of Japan. The city's name, 広島, means "Broad Island" in Japanese. 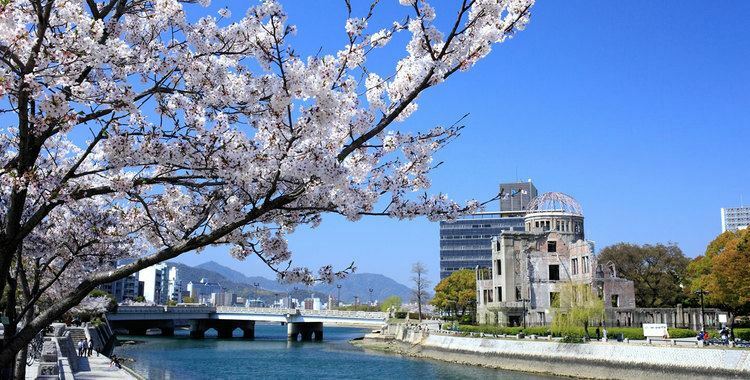 Hiroshima gained city status on April 1, 1889. On April 1, 1980, Hiroshima became a designated city. As of August 2016, the city had an estimated population of 1,196,274. The GDP in Greater Hiroshima, Hiroshima Metropolitan Employment Area, is US$61.3 billion as of 2010. Kazumi Matsui has been the city's mayor since April 2011. Hiroshima is best known as the first city in history to be targeted by a nuclear weapon when the United States Army Air Forces (USAAF) dropped an atomic bomb on the city at 8:15 a.m. on August 6, 1945, near the end of World War II. Hiroshima was established on the delta coastline of the Seto Inland Sea in 1589 by powerful warlord Mōri Terumoto, who made it his capital after leaving Kōriyama Castle in Aki Province. Hiroshima Castle was quickly built, and in 1593 Terumoto moved in. Terumoto was on the losing side at the Battle of Sekigahara. The winner of the battle, Tokugawa Ieyasu, deprived Mōri Terumoto of most of his fiefs, including Hiroshima and gave Aki Province to Masanori Fukushima, a daimyō who had supported Tokugawa. From 1619 until 1871, Hiroshima was ruled by the Asano clan. The San'yō Railway was extended to Hiroshima in 1894, and a rail line from the main station to the harbor was constructed for military transportation during the First Sino-Japanese War. During that war, the Japanese government moved temporarily to Hiroshima, and Emperor Meiji maintained his headquarters at Hiroshima Castle from September 15, 1894, to April 27, 1895. The significance of Hiroshima for the Japanese government can be discerned from the fact that the first round of talks between Chinese and Japanese representatives to end the Sino-Japanese War was held in Hiroshima, from February 1 to February 4, 1895. New industrial plants, including cotton mills, were established in Hiroshima in the late 19th century. Further industrialization in Hiroshima was stimulated during the Russo-Japanese War in 1904, which required development and production of military supplies. The Hiroshima Prefectural Commercial Exhibition Hall was constructed in 1915 as a center for trade and exhibition of new products. Later, its name was changed to Hiroshima Prefectural Product Exhibition Hall, and again to Hiroshima Prefectural Industrial Promotion Hall. On Monday, August 6, 1945, at 8:15 a.m., the nuclear weapon "Little Boy" was dropped on Hiroshima by an American B-29 bomber, the Enola Gay, flown by Colonel Paul Tibbets, directly killing an estimated 70,000 people, including 20,000 Japanese combatants and 2,000 Korean slave laborers. By the end of the year, injury and radiation brought the total number of deaths to 90,000–166,000. The population before the bombing was around 340,000 to 350,000. About 70% of the city's buildings were destroyed, and another 7% severely damaged. In 1949, a design was selected for the Hiroshima Peace Memorial Park. Hiroshima Prefectural Industrial Promotion Hall, the closest surviving building to the location of the bomb's detonation, was designated the Genbaku Dome (原爆ドーム) or "Atomic Dome", a part of the Hiroshima Peace Memorial Park. The Hiroshima Peace Memorial Museum was opened in 1955 in the Peace Park. Hiroshima also contains a Peace Pagoda, built in 1966 by Nipponzan-Myōhōji. Uniquely, the pagoda is made of steel, rather than the usual stone. On May 27, 2016, Barack Obama visited Hiroshima, being the first sitting president of the United States to visit since the drop of the atomic bomb. Schedule Hiroshima is situated on the Ōta River delta, on Hiroshima Bay, facing the Seto Inland Sea on its south side. The river's six channels divide Hiroshima into several islets. Hiroshima has a humid subtropical climate characterized by cool to mild winters and hot humid summers. Like much of the rest of Japan, Hiroshima experiences a seasonal temperature lag in summer, with August rather than July being the warmest month of the year. Precipitation occurs year-round, although winter is the driest season. Rainfall peaks in June and July, with August experiencing sunnier and drier conditions. As of 2006, the city has an estimated population of 1,154,391, while the total population for the metropolitan area was estimated as 2,043,788 in 2000. The total area of the city is 905.08 square kilometres (349.45 sq mi), with a population density of 1275.4 persons per km². The population around 1910 was 143,000. Before World War II, Hiroshima's population had grown to 360,000, and peaked at 419,182 in 1942. Following the atomic bombing in 1945, the population dropped to 137,197. By 1955, the city's population had returned to pre-war levels. Hiroshima is served by Hiroshima Airport (IATA: HIJ, ICAO: RJOA), located 50 kilometres (31 mi) east of the city, with regular flights to Tokyo, Sapporo, Sendai, Okinawa, and also to China, Taiwan and South Korea. Streetcars and light rail vehicles are still rolling down Hiroshima's streets, including nuked streetcars 651 and 652, which are among the older streetcars in the system. When Kyoto and Fukuoka discontinued their trolley systems, Hiroshima bought them up at discounted prices, and, by 2011, the city had 298 streetcars, more than any other city in Japan. Hiroshima is served by Japan National Route 54, Hiroshima Prefectural Route 37 (Hiroshima-Miyoshi Route), Hiroshima Prefectural Route 70 (Hiroshima-Nakashima Route), Hiroshima Prefectural Route 84 (Higashi Kaita Hiroshima Route), Hiroshima Prefectural Route 164 (Hiroshima-Kaita Route), and Hiroshima Prefectural Route 264 (Nakayama-Onaga Route). Hiroshima has a professional symphony orchestra, which has performed at Wel City Hiroshima since 1963. There are also many museums in Hiroshima, including the Hiroshima Peace Memorial Museum, along with several art museums. The Hiroshima Museum of Art, which has a large collection of French renaissance art, opened in 1978. The Hiroshima Prefectural Art Museum opened in 1968, and is located near Shukkei-en gardens. The Hiroshima City Museum of Contemporary Art, which opened in 1989, is located near Hijiyama Park. Festivals include Hiroshima Flower Festival and Hiroshima International Animation Festival. Hiroshima Peace Memorial Park, which includes the Hiroshima Peace Memorial, draws many visitors from around the world, especially for the Hiroshima Peace Memorial Ceremony, an annual commemoration held on the date of the atomic bombing. The park also contains a large collection of monuments, including the Children's Peace Monument, the Hiroshima National Peace Memorial Hall for the Atomic Bomb Victims and many others. Hiroshima's rebuilt castle (nicknamed Rijō, meaning Koi Castle) houses a museum of life in the Edo period. Hiroshima Gokoku Shrine is within the walls of the castle. Other attractions in Hiroshima include Shukkei-en, Fudōin, Mitaki-dera, and Hijiyama Park. Hiroshima is known for okonomiyaki, a savory (umami) pancake cooked on an Iron-plate, usually in front of the customer. It is cooked with various ingredients, which are layered rather than mixed together as done with the Osaka version of okonomiyaki. The layers are typically egg, cabbage, bean sprouts (moyashi), sliced pork/bacon with optional items (mayonnaise, fried squid, octopus, cheese, mochi, kimchi, etc. ), and noodles (soba, udon) topped with another layer of egg and a generous dollop of okonomiyaki sauce (Carp and Otafuku are two popular brands). The amount of cabbage used is usually 3 to 4 times the amount used in the Osaka style. It starts out piled very high and is generally pushed down as the cabbage cooks. The order of the layers may vary slightly depending on the chef's style and preference, and ingredients will vary depending on the preference of the customer. The Chugoku Shimbun is the local newspaper serving Hiroshima. It publishes both morning paper and evening editions. Television stations include Hiroshima Home Television, Hiroshima TV, TV Shinhiroshima, and the RCC Broadcasting Company. Radio stations include Hiroshima FM, Chugoku Communication Network, FM Fukuyama, FM Nanami, and Onomichi FM. Hiroshima is also served by NHK, Japan's public broadcaster, with television and radio broadcasting. Hiroshima University was established in 1949, as part of a national restructuring of the education system. One national university was set up in each prefecture, including Hiroshima University, which combined eight existing institutions (Hiroshima University of Literature and Science, Hiroshima School of Secondary Education, Hiroshima School of Education, Hiroshima Women's School of Secondary Education, Hiroshima School of Education for Youth, Hiroshima Higher School, Hiroshima Higher Technical School, and Hiroshima Municipal Higher Technical School), with the Hiroshima Prefectural Medical College added in 1953. But, in 1972 the relocation of Hiroshima University was decided from urban areas of Hiroshima City to wider campus in Higashihiroshima City. By 1995 almost all campuses were relocated to Higashihiroshima. But, School of Medicine, School of Dentistry, School of Pharmaceutical Sciences and Graduate School in these fields in Kasumi Campus and Law School and Center for Research on Regional Economic System in Higashi-Senda Campus are still in Hiroshima City. Hiroshima has several professional sports clubs. The city's main football club are Sanfrecce Hiroshima, who play at the Hiroshima Big Arch. As Toyo Kogyo Soccer Club, they won the Japan Soccer League five times between 1965 and 1970 and the Emperor's Cup in 1965, 1967 and 1969. After adopting their current name in 1992, the club won the J. League in 2012 and 2013. The city's main women's football club is Angeviolet Hiroshima. Defunct clubs include Rijo Shukyu, who won the Emperor's Cup in 1924 and 1925, and Ẽfini Hiroshima. Hiroshima Toyo Carp are the city's major baseball club, and play at the Mazda Stadium. Members of the Central League, the club won the Japan Series in 1979, 1980 and 1984. Other sports clubs include Hiroshima Dragonflies (basketball), Hiroshima Maple Reds (handball) and JT Thunders (volleyball). The Woodone Open Hiroshima was part of the Japan Golf Tour between 1973 and 2007. The city also hosted the 1994 Asian Games, using the Big Arch stadium, which is now used for the annual Mikio Oda Memorial International Amateur Athletic Game. The now-called Hiroshima Prefectural Sports Center was one of the host arenas of the 2006 FIBA World Championship (basketball). The Japanese city of Hiroshima may have been devastated by the atomic bomb almost 70 years ago, but today, this site of the destruction is one of the top tourist destinations in the entire country. Statistics released by the nation's tourist agency revealed that around 363,000 visitors went to the metropolis during 2012, with US citizens making up the vast majority of that figure, followed by Australians and the Chinese. Within Japan, Hiroshima has a similar relationship with Nagasaki.